Assistance (ASA), which has a program and website – SALT – aimed at educating and counseling students on strategies to minimize how much they borrow and to manage their loan payments. ASA is gaining traction. Spokeswoman Allesandra Lanza said some 340,000 people have signed on to SALT – it’s free – over the past six months. SALT features advice, financial aid and loan consolidation information, a blog, and resources such as loan calculators. Students attending one of the 250 colleges that currently participate in ASA programs also are entitled to call up one of ASA’s 30 financial counselors specializing in college loans. On-campus ASA ambassadors raise awareness of the student debt issue. 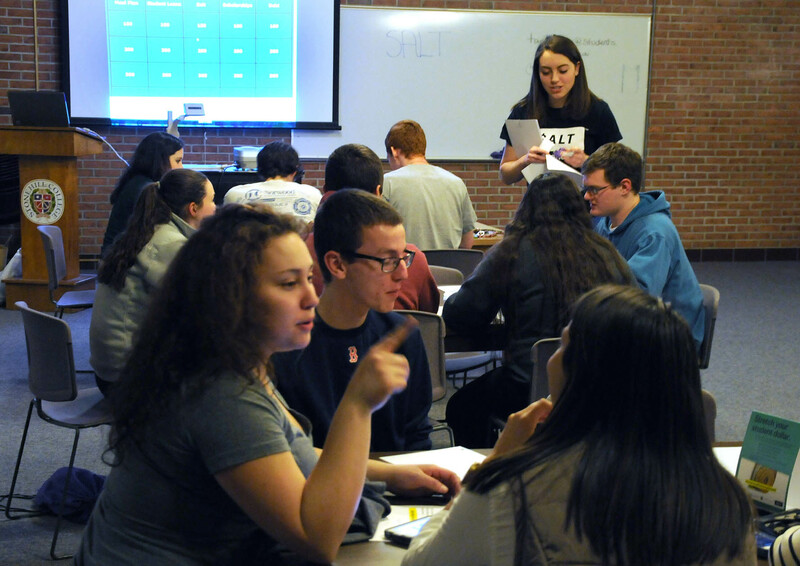 Andrade recently hosted a Jeopardy game that featured various loan topics and lured classmates with free cookies and a raffle for a Stonehill College sweatshirt. In another outreach campaign, ASA intern Faith Gagliardi developed awareness of the website on social media, using the Twitter handle @SALT_Money. Gagliardi admits to learning a hard lesson about ignoring her mounting college debt. She owed about $150,000 upon graduating last August from the Wentworth Institute of Technology in Boston, requiring $1,500 in monthly payments. When she was taking out the loans during college, “I had no idea how much or what kind or how many or anything about them – who serviced them or when I paid them, how much that would be,” she said. Great article. It is wonderful that Miss Andrade is in a position to chip away at her student loan debt. But I am sure a large majority of students are not able to follow in her footsteps. In recent years, many of the loans require payment while in school anyway and students do not have any choice but to pay if they want the chance to attend college. As a result, parents end up helping out with tuition and living expenses as well as paying some portion of the monthly student loan bill. It is just another fact of life especially if families are interested in making sure their children pursue higher education.